On the 2nd to 3rd August NSTC participated in the 23rd Ocean Engineering Symposium 2012, held at the Nihon University College of Science and Technology in Tokyo. NSTC’s presentation was on the need for growth in safety education for offshore industry workers and their aims, facilities and the training contents of NSTC courses. 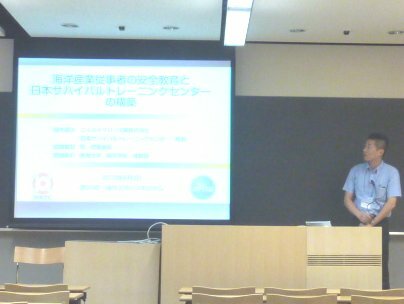 It was entitled ” Nippon Survival Training Center for the employer safety education in Japanese marine industry”. Also JOGMEC, JAMSTEC as well as Universities made absorbing presentations during this session.